In 1957 when the former Gold Coast declared its independence from Britain it emphasized freedom, justice, equality and education for all regardless of background. In 55 years of independence Ghana has successfully avoided many of the tragedies that plague so many African nations, yet the envisioned unified Africa was never achieved and a series of coups have ensued leading to widespread corruption and inequality throughout Ghana. At a glance Ghana has it all: land filled with prized minerals, oils, gems, gold, and gases, fertile agricultural lands, and wide spread primary education for its population. Ghana, colored by a diverse population of 5 major ethnic groups, as well as 52 minority groups, is a true melting pot connected through a surprising common language: English; which is the official language, but Ghanaians usually speak at least one local language as well. These ethnic differences are embraced and even encouraged. Ghana may seem to have all the ingredients for a recipe for success, yet most Ghanaians live on less than $1.25 a day, 25% of the youth are unemployed, energy is limited making blackouts common, and education beyond the primary level is difficult to acquire. The capital of the Volta region: Ho, Ghana acts as the home base for the Globe Aware’s Ghana operations. Globe Aware works with local grass roots organizations in over 40 villages to improve the standard of living as well as increase the educational opportunities for both the urban and rural dwellers of these communities through the empowerment of women and positively impacting the education, health and biological environments of these areas. Ghanaian culture is rich and open, encouraging active participation from all community members as well as guests. Dance and music play a large role in the life of Ghanaians. Each village will have dances and songs unique to them and their particular celebrations, but visitors are quickly taught the steps. Ghanaians love to laugh and share their world! Do not hesitate to share your world, talents and smile with them as well! Ho is not only the capital of the Volta region but also home to some of the most breathtaking natural treasures including the lush Wli waterfall, Lake Volta and Mount Afadjato, the tallest mountain in Ghana. It is currently the wet season in West Africa which allows for visitors to view the bountiful wild and plant life indigenous to the area. Ghana is more closely located to the geographical center of the world than any other country in the world making its climate hospitable to a myriad of interesting finds. The mahogany, ebony, mangrove, cacao, and acacia trees all find a home in the Volta region as well as many animals specific to Ghana. Buffalos, savannah elephants, mongooses, monkeys, chimps, and aardvarks all call the Volta region home. Visitors are often treated to spectacular views of these and other inhabitants. Culturally, Ghana is one of the most spectacular destinations. The people, along with their traditions and welcoming bravado make the trip inviting and exciting! It would be hard to leave Ghana unchanged! When Aimee Little is not volunteering she is a Mentor with a nonprofit organization that provides students not only with the financial means to attend college but with the mental and emotional support to make their transition successful as well. Aimee is passionate about education and the impact it can have on one’s future, she took this passion to Peru. 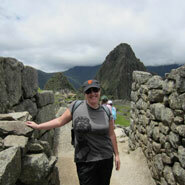 Aimee traveled with Globe Aware to Cusco, Peru to improve the lives of the rural people of the Andes. She used her skills as a mentor to encourage and promote the value of education to the youths of Cusco. Thank you Aimee for sharing your passion with the people of Cusco and Globe Aware! Those colorful garments are not simply for decoration. The colors, patterns, and shapes of the Kente cloth actually hold meaning and can represent history, status, religion and social values. Each garment is hand-woven (traditionally by men.) It is worn for ceremonies, festivals, and other sacred occasions. It is also a prized gift for important events. Obi Nkye Obi Kwan Mu Si (o-Bee n-che o-Bee k-wahn moo see) The name of this pattern translates into "sooner or later one could stray into another person's path." The meaning of this saying is that nobody is perfect and everybody makes mistakes. If someone happens to get in your way or does something to offend you, it is important to be understanding and to forgive that person. This cloth represents "the green snake of the Asona," one of the seven families. The Asante social system has seven main families. Each family has its own responsibilities and rights. The translation for the name of this pattern is "Fathia is a befitting wife for Nkrumah." Fathia was a charming Egyptian woman who married Nkrumah, the first president of the Republic of Ghana. Their marriage was considered special because it represented the unity of African peoples on the continent. The name for this pattern means, "the extended family is a force." This cloth celebrates the extended family and its important role in maintaining the well being of its members. What do individual colors mean? YELLOW is a symbol for things that are holy and precious. MAROON is associated with the color of Earth, the mother. It represents healing and protection from evil. BLUE stands for the sky and is used to symbolize holiness, peace, harmony, good fortune, and love. GREEN is associated with plants and stand for growth and good health. GOLD like the metal gold, is a symbol of royalty, wealth, and spiritual purity. WHITE stands for purity and healing. BLACK stands for aging, also for strong spiritual energy, and the spirits of the ancestors. SILVER stands for the moon and represents serenity, purity and joy. PURPLE like maroon, is associated with Earth and with healing. Globe Aware volunteers in Ghana visit an open air market where traditional weavers still make the Kente Cloth on wooden looms. "Research shows that people who volunteer..."
"A new study found that young adults..."
Ever read one of these headlines and thought, "Where do they find people for these studies?" If your are planning to go on your first International Volunteerism trip for up to 2 weeks and are between the ages of 18-30, consider this a golden opportunity to share your story! You are cordially invited to participate in a research study that will explore some of the changes that young adults experience after participating in short- term International Volunteerism Service for the first time. after you return from your trip. Throughout the study your participation is voluntary and all the information you provide will be kept in a secure manner so that it remains completely confidential. After the study is complete participants will have access to information about the study's findings and results. So...want to help make research happen? You will receive an email with all the consent details and a personal invite link to the research site. Follow the link to take the questionnaire before and after your internationalolunteerism trip. ...Thank you for serving as an International Volunteer and for considering being a part of this study!